Frequent flyers on the Friday BeerBuzz will not only remember the great show we did with Steve Mashington from Yards Brewing back in January of 2011. 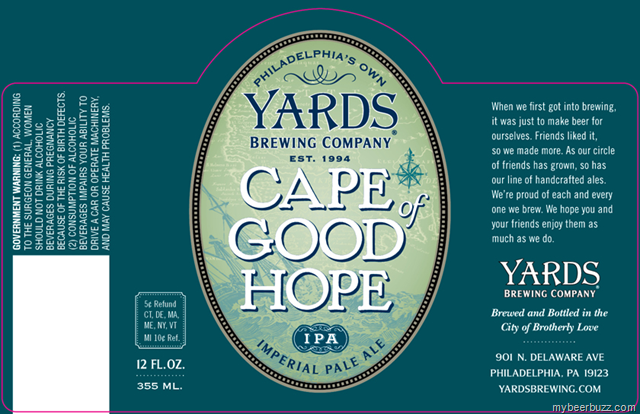 We profiled Yards ESA, (asked Steve about his non-existent engagement)…but more importantly, Steve announced that we should watch for Yards Cape of Good Hope IPA to come out in bottles in the future. 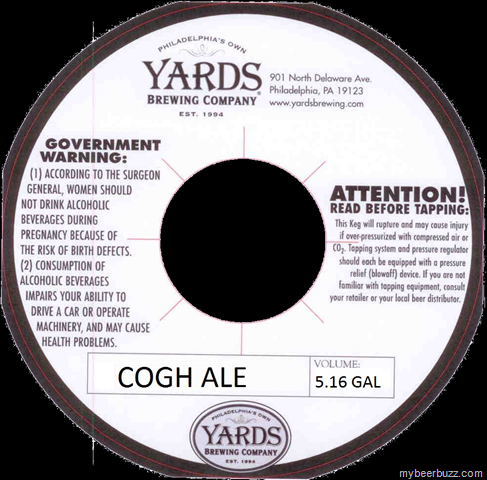 Flash forward June 2nd, and sure enough, Yards received label approval for Cape of Good Hope bottles and COGH Ale kegs. As promised we checked in with Steve again a month or so ago and found out Cape of Good Hope IPA would hit the streets in a somewhat limited release in Aug…so here we are. It was fun to have Steve join us to sample the new Cape of Good Hope Imperial IPA. Probably not as fun as the engagement joke played on us on the last show with Steve or even the visit to Yards to pick up COGH, but it was still a ton of fun having Steve back with this great new beer. You’ll note that COGH uses the “I” in IPA as “Imperial” not “India” and for very good reason. This is a big, certainly Imperial-level IPA. Strong in ABV, strong in IBU and strong in flavor….but oddly enough the beer has a wonderful delicate mouthfeel that I’m pretty sure most people will really love. Get down to Yards brewing Co in Philly and try this one for yourself. to Steve Mashington from Yards Brewing, Nancy, John, Joe, and Bosco for yet another fun Friday. Thanks for all of the great comments ocming in. I'm away from the computer today so I won;t be able to moderate until later this afternoon or evening. We had a great time on the show today and Steve Mashington is always a great guest...and I have to sya that Cape of Good Hop IPA has become another show favorite beer! As you mentioned on the show this morning Bill, one sign that hop lovers look for that tells them they'll probably like a beer is when your nose can detect the hops while the beer is still more than a foot away. COGH passes with flying colors! If you like IPA's (who doesn't?) this one belongs on your 'short list' of favorites! Thanks to Steve Mashington for this fine beer and for being on the show this morning. Thank you Bill and thanks to all who listen to The Friday BeerBuzz! A GREAT beer. Seriously, you've got to get your hands on one. :) My favorite so far this year buzzers. I agree Nancy...Yards COGH is rapidly becoming a show favorite! Excellent show. I lve this beer and had some down in Philly last weekend. Yards is so underrated! I agree Marty....and we were actually at Yards last Saturday! Did we see you? PS I'll be catching up on comment posting soon....there are quite a few awaiting my moderation! We're going to Philly on Saturday so pending Irene I may be sampling some Cape @ Yards! Be safe Chris...but DO get to Yards and try COGH. Nice show. Every since your Yards Pale Ale show last year I've managed to keep Philly Pale Ale in my fridge every weekend. After the ESA show I started buying ESA and Brawler. My wife now calls me Mr Yards because that's all I drink. They make the best beer I've ever tasted. But now I have to get down and try Cape of Good Hope. Thank you beerbuzz guy and Yards too. Great show guys. I'm a huge Yards fan and I never heard of this beer until today. Cheers! I love a good double IPA and today's sounded good. I can always tell when you guys love a beer. Guilty as charged Adam. I love this beer...so much so I took two cases home from the brewery last weekend. I'm drinking a Yards IPA now. Thank you everyone...I'm doing my best to moderate the comments...about 25 or 30 more to go....but when I delay like this the spammers mix in about 100 spam comments so it's a lot of work......I will get thru it....but it may be after happy hour ;) Thank you all again and a BIG thank you to Steve Mashington from Yards! I like Yards quite a bit, in fact their IPA is probably my favorite beer, until now. If I can get COGH that might change. I tried brewing a version of their IPA at home but it didn't come out so great. Thanks Artie....don't wait. COGH is very limited. I met Yards brewer Tom a few years ago at a festival. Very nice man and really proud of his beers. What size bottles are COGH in? 12oz and on tap as well...but very limited. I believe the last sixtel at the brewery sold when we were there last Sat. I love that you're back to doing IPA's again. Me too Eric...and be sure to tune in next week! I've been a beer show skeptic. I mean how can you honestly expect us to enjoy 1 different beer a week for every week, and go on and on. It just seems silly when ethere are so many other serious things going on. Just thought I'd share. Fair enough Anon...although I think what you may be missing is that we're trying to be a tiny bit of relief from everything serious going on. It's Friday...not everything has to be serious...and yes 1 different beer a week may actually be fun...we're not eaching rocket science here...we leave that to Rusty Fender. We're having fun...experincing a few new beers...and maybe...just maybe you'll find one you really like. In the end I guess I'd say..."What's the harm?" Fair enough I guess. I did like the 3 Philosophers ou had on, and after all the fuss I had to try it. Sorry for the negative Nancy. A great beer choice today! I love Yards and can't wait to try this one. Don't wait Jenna....COGH is fading fast! Ha! yes Anon...more IPA's...we love the style and all the great variations...and with fall and winter approaching you'll see plenty of non-IPA's too...so what DO you like? I really like whiskey barrel stouts and dark stouts. Me too Anon. Dig back about 2 or 3 weeks and check out our Ola Dubh show with our very own Vince Sweeney. A great whiskey-barrel aged stout! How do I get to appear on the friday beer buzz? Fair Enough. But I'd still ilke to see some dark barrel beers. Fair enough Anon. I promise you'll see more than a few dark and barrel-aged brews in the coming months. Thanks for all the great comments today and I apologize for the delay. For those asking...the vidoe is still in progress and will be up soon....so stay tuned!